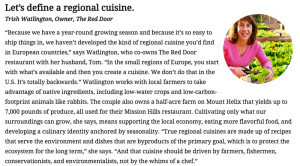 Mission Hills is very proud to say one of our local business members, Trish Watlington, Owner of The Red Door and The Wellington, as well as President Emeritus of the Mission Hills BID, was featured in San Diego Magazine’s 26 BIG Ideas list. To read the full list of BIG ideas, visit the San Diego Magazine’s article. Mission Hills Artists Sale July 20, 2013 10a.m.-4p.m.